SPDX, Spiritual Diagnosis, was a precursor to Pictorial Astrology. It taught the author to think symbolically and eventually look at a horoscope in the same way. You can do the same thing, as you will gradually see in coming lessons. Working with the earliest construction paper version of SPDX, Peace Arnold and I sat down with our friend Bubbles who drew cards to create the top/first Mandala on the attachment. Within days, she was saying, "I am working on it. Let's do another to see how I'm doing." We stalled Bubbles knowing change takes time. But, she kept insisting and the second Mandala was done little more than a month later. I invite your comments. This might be a good time for beginners to look in and throw in. Most of the images/symbols are fairly clear. But, a few may use some explanation of the original image. Mandala 1: Mind - The Eye of Horus. Lesson - Cornucopia. Mandala 2: Dis-ease - Globe. Persona - Atlas holding up the World. Healing - Speaker. Soul - Stylized Flame. Lesson - Winding Staircase. Way - Flowers. ENERGY: Relating to movement, change, action, or lack thereof. FEELING: These are always animals. FEELING can also represent BEHAVIOR. MIND: These are busts, faces or parts thereof. SOUL: Religious, spiritual or metaphysical symbols. The other centers have a variety of images intended to fit - as well as possible - the named meaning. Bubbles did her SPDXs just a few weeks apart and quite clearly little had changed. But, life generally changes slowly, so Bubbles had unrealistic expectations. We will go through the centers one at a time. ENERGY: Windsock and pinwheel both related to wind. Maybe "windblown." FEELING: Dog and tiger. A difference here. MIND: Both images depict eyes. PERSONA: The same fellow with empty pockets appears in both. SOUL: Flames are shown in each version. LESSON: Some variation, I don’t recall what the second image meant to Bubbles. HEALING: Both images suggest creative expression. Money was the obvious - what’s on top - issue, even though Bubbles had quite adequate income. PERCEPTION. Bubbles immediately began putting money in her pockets and filling her wallet, theoretically changing the way she dealt with money. In the interim, she began to worry as well about the war in the Balkans. The Cornucopia suggested recognizing her Abundance, monetary and otherwise. The Healing Angel spoke about her hands-on healing work. The Soul and Mind images pointed towards Bubbles’s intuitive abilities and spiritual interests. 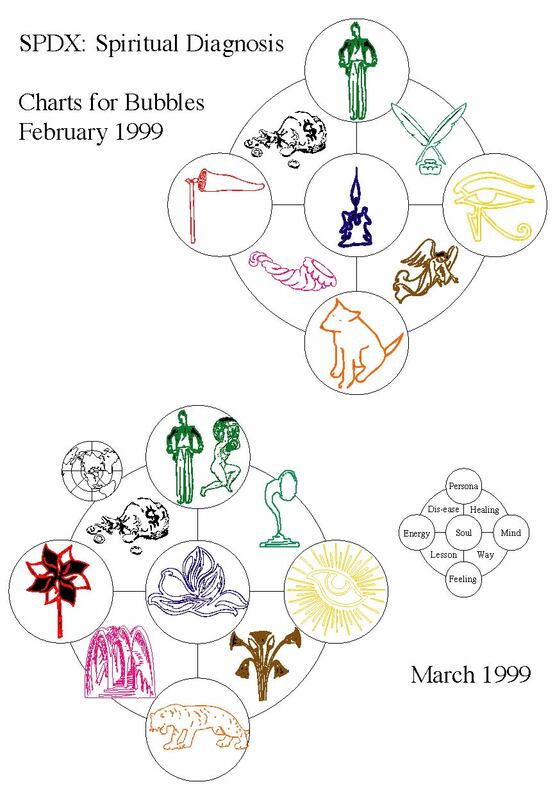 Healing symbols, as suggested above, seem to be about expression of abilities and inevitable results. Generally speaking, SPDX - as best healing practices do - point individuals away from the DIS-EASE to the higher, better, more outgoing to achieve HEALING. Focusing on DISEASE or DIS-EASE, often just makes us cling to it more so. Empowering it, instead of us.